A Consequence Of Greed is a dramatic part-supernatural fiction and is Book Two in the American Drama Series. If you haven't already, you can read my review of Book One, "Head Trip", here. 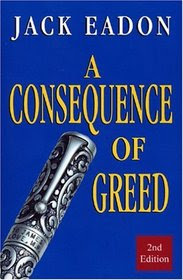 Marcus Ramsey returns in "A Consequence Of Greed", as a corporate trouble-shooter who has recently been transferred from Chicago to a smaller division of Allied Foods in central Texas. The townsfolk and his co-workers, all call him "Yankee" and believe he is up to no good by being transferred. This isn't the first time he had been transferred to this division, the first time, ten years ago, Marcus had just arrived in town, when he learned that the company president, James Post, had just died in a car accident. The townsfolk and co-workers greatly revered James Post, the now deceased president of Allied Foods, which allows Earl Hickman the perfect opportunity to become the new president. When Marcus arrives in town, the Hickmans become agitated and nervous as Marcus reminds them of James, and the Hickmans and a few others in town, have a few secrets in their closets that they would like to remain buried. Marcus has been having weird visions and acting strange but he chalks it up to the flu. However, he isn't so sure, as the attacks continue and to top it all off, his wife, Kathy, has recently divorced him, leaving him with a new job in a hostile town and no one to vent his frustrations upon. Marcus doesn't realize that he has been possessed by the spirit of James Post, who has returned to right the wrongs that surround his untimely death. Marcus begins to look at everyone with suspicion and as the clues begin to uncover, Marcus realizes his time with Allied Foods is drawing to a close. I love the writing style of Jack Eadon, it is the type of writing that keeps one wanting to continue with the story. The upbeat, honest approach to his writing style is wonderful to read and the flow of words is soothing to the reader as you unravel the mysteries surrounding Marcus. I loved the possession aspect of Marcus with that of James and equally enjoyed, Mr. Waverly, the British cabbie who seems to follow Marcus around, always showing up to offer a lift when Marcus needs it. Mr. Waverly has an agenda all of his own and he also there to right the wrongs that occurred ten years ago. I would have loved to seen more of Mr. Waverly in the book, or at least given more insight into his back story and his purpose in the James Post affair. I feel I was left lacking with this character, who seemed an integral secondary player, even though he was enjoyable to read in his brevity. There were a few editorial issues with the story, like when Earl is called Mac a few times, I had to stop my read and wonder if I had missed something and realized it was just an editing issue. It wasn't much to defer from the plot nor hinder from the story. I would give this book a four out of five stars, it is an excellent read that grips you, drawing you closer to the conclusion of the story and the machinations of greed that appears to be driving everyone forward. I would've liked to have had more information about the supernatural aspects that surrounded Marcus, it would give him and his story, more definition and clarity. I loved the wit and intelligence that the author wrote into his characters and I am definitely looking forward to reading more by Jack Eadon! !